Make your own DIY summer tote bags and complete your trendy look this season! If you’re up for some summer-handy sewing projects, these DIY tote bags are what you need. 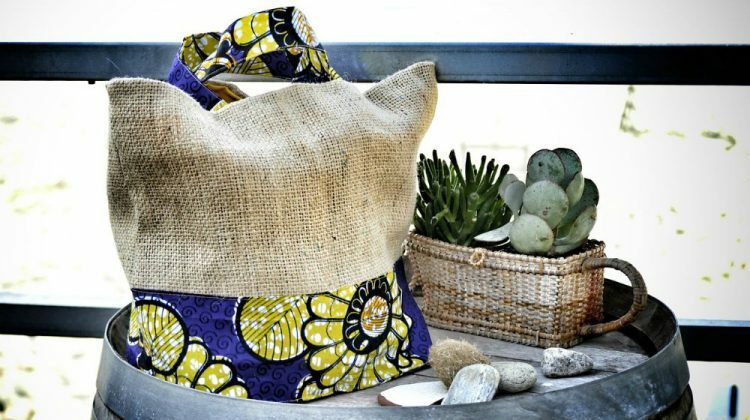 Here is a list of trendy and easy-to-sew summer tote bags even beginners can do. Skip the shopping and create your own style with any of these design guides for DIY summer tote bags! DIY Summer Tote Bags to Sew and Match With Your OOTD! There is something about navy blue and white stripes which evokes a classic summer aesthetic. Bring this simple and beautiful vibe with you by recreating this simple summer tote bag! We definitely love the rope touch of it, giving the look a nautical vibe. These metallic tote bags are absolutely eye-catching but easy to make. You can take it with you everywhere you go. The tutorial comes in two designs with terrific shiny details! If a friends ask where you got the tote, it’s up to you to keep it secret or be the generous girlfriend who shares this post. This cute summer pineapple tote bag is so easy to stitch and perfect for use outdoors! It’s pretty timely too with pineapple detailing just right for summer. We love the extra large rope handles which make it trendy. A tote is a summer essential but if you’re a backpack gal, you can have the best of both worlds. This DIY tote to backpack idea is pretty nifty with a special trick to restore it to a tote whenever you feel like it. It’s a 2-in-1 summer bag we love! Learn to make a tote bag with this easy stylish knot tote. Use light materials like twill which is the fabric used to make the tote bag design. With this free pattern, you can make tote bags either for gifts or for some extra cha-ching! Here’s a chic use of mesh, which is cheap and easily wielded like any other fabric. We love the combination of the punchy orange and the silvery mesh. It looks sophisticated and hits the right note for summer. These gorgeous colors in a Navajo blanket remind us of summer holidays! A Navajo blanket tote bag will match any colored outfit you wear! Yes, you read it right…any color! With the summer season in full swing, this vivid tote is perfect to carry all your beach essentials. A patchwork quilt will never lose its charm. In fact, it is a classic favorite which is more adorable with time. We love this patchwork guilt tote bag design which comes with the step-by-step tutorial. With this guide, it’ll be easy to make this tote bag pattern for beginners! You’ll dust your idle sewing machine right after checking out this quilted tote bag pattern. Summer isn’t complete without any trace of tie-dyed stuff! Linda Matthew’s guide to tie-dyeing a pre-made tote bag is one easy way to start this summer sewing project series. You can also try Linda Matthew’s 30-minute tote bag to make things more exciting! Turn your spare tea towels into a cute summer tote bag! This sewing idea is an affordable and creative way to exercise your sewing skills. Learn more about this idea by visiting Helen Rawlinson’s tutorial! Look extra fab while lounging at the poolside with this lovely handbag. This summer tote bag from We All Sew can be a little challenging to make, but is definitely worth it! For summer, we want a sturdy bag for our long list of essentials with pockets to keep them organized. This Renegade DIY tote bag could be very well just what you’re looking for. Its handle is stitched from the bottom to the top for added support, plus the compartments you need! Got lots of coordinating fabric laying around? Perfect! This summer tote bag idea from Crazy Little Projects is just right for you. With two matching fabrics, you can easily make this colorful printed tote bag. Nautical-themed everything is just all the rage this season. Match the sea and sand to your tote bag! Recreate this lovely sewing project from So Sew Easy by following their tutorial. Would you believe this tote bag is made from potato stamps? That’s right! This summer sewing project will definitely be a hit with your little ones. Learn more by reading Hello Wonderful’s easy guide. Discover a shiny, shimmering, splendid world with this metallic print tote bag! Just follow this easy guide from Craftaholics Anonymous to make your version of it. Summer is all about the colors and patterns! This sewing idea from V and Co uses hexagonal prints of different fabrics that will surely add more color and vibrancy to your summer. Are you a lover of the written word or a fan of crunching numbers? Then this ombre tote bag is just the perfect summer sewing project for you! This tutorial from I Love to Create offers a great tutorial to help you recreate this sewing idea. Life is always better with wine around. So make your summer sweeter and better with a handy bottle of wine! This double-pocket wine tote from Infarrantly Creative looks perfect for this purpose. Bring some love out and about with you anywhere you go this summer! This ombre heart-painted tote bag from V and Co will definitely take your summer OOTD to the next level. Want to make something more challenging and definitely more colorful? Then this sewing project is just the right fit for you! This neon printed tote bag from Made Everyday will certainly bring out the vibrant colors of summer. Do you have a spare pillowcase or two that don’t match any bedspread anymore? Well, don’t throw them away just yet. You may turn them into this cute and easy-to-make pillowcase tote bag! This idea from Melissa Esplin is both practical and really fashionable. When you travel over the summer, packing the minimum amount of stuff is key. Save more space by having your towel and bag all rolled into one, literally! Recreate this sewing idea from The Seaman Mom’s step-by-step tutorial. Statement shirts may have been a thing of the trendy past but they sure will still come in handy! Turn your spare shirts into the perfect summer t-shirt tote bags! Let Instructables walk you through the whole process to learn more. Never worry about water and sand damaging your stuff! With this shower curtain tote bag, everything you pack inside will remain bone dry. A bonus: It comes cheap as can be! Use any spare shower curtain you have and follow Brit.co’s tutorial. Making your own DIY summer tote bags gives three things. One: They are fun sewing projects. Two: They both save you or make you money if you know what I mean… wink! Wink! Three: You get to sport a bag of your own design, style, and creation. Get your sewing essentials, fire up your can-do attitude, and make these DIY summer tote bags! Which of these DIY summer tote bags are you eyeing to match your OOTD this season? We’d love to know your fashion statement in the comments section below! Editor’s Note – This article was originally posted on May 28, 2016, and has since been updated for quality and relevancy.